The purpose of this pilot study was to evaluate the effectiveness of an occupational therapy intervention for caregivers of clients with low vision to increase their understanding of the effect of vision loss on occupational performance. Seven caregivers of clients attending a low vision clinic participated in the intervention, which included educational materials, an experiential component, and practical suggestions individualized to each situation. After the intervention, caregivers showed improvements in knowledge, understanding, and skills relevant to their role. Relationships underwent a positive transformation, as did the perceptions of the challenges and benefits of caregiving. 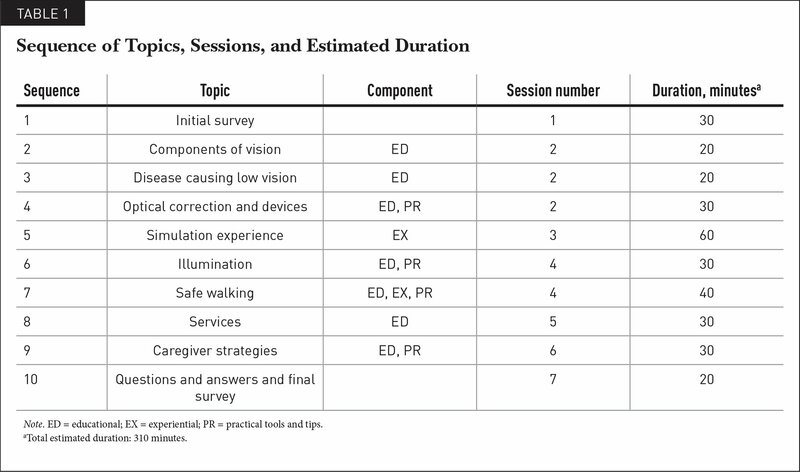 Caregivers benefited most from simulation of the care receiver's visual condition. More than one fifth of people living in the United States are informal caregivers, meaning that they attend to the needs of a sick or disabled family member or friend without compensation. In 2015, this number approximated 43.5 million people who spent an average of 24 hours per week in caregiving duties, and more than 78% of those who received care were 50 years or older (National Alliance for Caregiving, 2015). The needs of caregivers for support, information, and training are not being met, although it has been known for more than a decade that family caregivers actively seek knowledge and skills to care for their loved ones (Caregiver Action Network, 2016). The situation is no different for caregivers of those with low vision, a hidden disability. The fact that low vision is not total loss of vision but a condition in which there is still usable vision often perplexes clients, families, and friends (Sussman-Skalka, 2002). The challenges of caregiving can be compounded in the absence of knowledge and skills to assist the person who has uncorrectable vision loss as a result of an age-related eye disease, such as macular degeneration, diabetic retinopathy, or glaucoma. Currently, no occupational therapy programs or protocols are available for those caring for people with low vision. This article describes the outcomes of an occupational therapy intervention for caregivers of people with low vision that was conducted in Memphis, Tennessee, through a university low vision clinic. The role of caregiving can produce both positive and negative effects, commonly measured as caregiver satisfaction and burden, respectively (Carbonneau, Caron, & Desrosiers, 2010; Moghimi, 2007; Silva-Smith, Theune, & Spaid, 2007). Care receivers can also experience negative effects associated with caregiving. A study of caregivers of veterans with chronic illnesses by Wakefield, Hayes, Boren, Pak, and Davis (2012) found that although two thirds of caregivers experienced strain, care receivers reported that too much assistance in instrumental activities of daily living resulted in greater strain as well. Bambara et al. (2009a) found that when caregivers had a negative view about their own ability to solve problems, this led to compromise in the health of both caregivers and clients with vision loss. A systematic review of families caring for loved ones with vision loss (Bambara et al., 2009b) found that low vision was a significant source of relationship stress and frequently resulted in divorce. A lack of understanding of the effect of vision loss led to overprotectiveness, which occurred when family members provided too much assistance. Overprotectiveness had a negative effect on the family member with vision loss because it resulted in delayed mastery of the environment. In addition, overprotectiveness led to poorer adjustment to vision loss by the care receiver and the family as a whole. Conversely, their study found that when families understood vision loss, the client had better emotional adjustment to low vision. These findings echoed an earlier cross-sectional study by Cimarolli, Reinhardt, and Horowitz (2006), which found that instrumental support (defined as help with shopping, housekeeping, transportation, mail, and finances) to clients with low vision could be perceived as overprotectiveness, which had significant negative effects on the client's ability to master the environment and adapt to vision loss. Too much assistance led to feelings of strain in the care receiver (Wakefield et al., 2012). Caregivers need support, such as financial aid and transportation assistance, respite from caregiving duties, and information about the care receiver's condition and prognosis. Two thirds of caregivers look to health care providers for this information (Lilly, Robinson, Holtzman, & Bottorff, 2012; Wachters-Kaufmann, Schuling, The, & Meyboom-de Jong, 2005). In a study by Foster, Layton, Qualls, and Klebe (2009), caregivers ranked knowledge, role adjustment, and competence in the top 5 of 11 goals, and caregivers reported benefit from individualized interventions versus workshops or programs. Caregivers need knowledge and skills to reduce their own stress (Given, Sherwood, & Given, 2008). A meta-analysis of the information needs of caregivers of older adults with chronic conditions concluded that caregivers strongly desired basic information that was understandable and was designed to meet their unique needs (Washington, Meadows, Elliott, & Koopman, 2011). Benefits for caregivers and care receivers. A meta-analysis of randomized clinical trials for caregivers of older adults (Sörensen, Pinquart, & Duberstein, 2002) showed that all interventions had a significant beneficial effect on caregiver burden, depression, subjective well-being, and skills as well as on care receiver symptoms. Participation in caregiver training workshops offered by a large U.S. health maintenance organization improved caregiver preparedness and reduced depression and sadness (Leutz et al., 2002), a finding that was repeated in Taiwan by Shyu, Chen, Chen, Wang, and Shao (2008). In this experimental study, caregivers who participated in a discharge planning program designed to educate them about the needs of stroke survivors felt better prepared for the caregiving role (Shyu et al., 2008). A randomized clinical trial that included care receivers who had a stroke and their caregivers found that caregivers who participated in three to five sessions of 30 to 45 minutes experienced less burden, anxiety, and depression and had higher quality of life than those who did not participate. Care receivers reported less anxiety and depression and better quality of life after their caregivers participated in the training (Kalra et al., 2004). Symptoms of depression decreased significantly after caregivers of older Hispanic adults with physical and/or cognitive disabilities participated in a support and training program (Huynh-Hohnbaum, Villa, Aranda, & Lambrinos, 2008). In a more recent study, the quality of life of stroke survivors was significantly higher in the physical, psychological, and environmental domains 2 months after their caregivers completed a training program (Chinchai, Bunyamark, & Sirisatayawong, 2010). Caregivers of veterans with chronic conditions reported significant improvement in mental health and caregiver burden after participating in a program consisting of 24-hour in-home respite care, caregiver group support, and education and skills training (LaVela, Johnson, Miskevics, & Weaver, 2012). Types of interventions. Sörensen et al. (2002) showed that educational and psychotherapeutic interventions had the largest and most consistent effect on all outcome variables—a result that was repeated in three meta-analyses of caregiver interventions for stroke survivors (Brereton, Carroll, & Barnston, 2007; Lee, Soeken, & Picot, 2007; Visser-Meily, van Heugten, Post, Schepers, & Lindeman, 2005). A meta-analysis by Smith et al. (2008) showed that information interventions improved knowledge of stroke among care receivers and caregivers. When comparing information provided in written or computer formats (passive information provision) with active information provision (lectures, opportunities to ask questions, and instruction in coping strategies), investigators found that the active interventions significantly improved caregiver quality of life at 12 months and had a greater effect on care receiver mood than passive information interventions (Smith et al., 2008). Likewise, caregivers who were trained in a problem-solving technique did better than those who received education only (Elliott, Berry, & Grant, 2009). Caregivers who used the problem-solving technique increased their constructive problem-solving abilities and reported a significant decrease in depression over a 12-month period, although no effects were observed for caregiver health or life satisfaction (Elliott et al., 2009). Perhaps most interestingly, provision of information, advice, and emotional support services to caregivers increased their odds of being satisfied compared with other types of services, such as help with personal care and instrumental activities of daily living (Savard, Leduc, Lebel, Béland, & Bergman, 2006). Costs of interventions. Stevenson (2004) analyzed the health care costs for caregivers and care receivers who were randomized to receive either structured training or usual care. Mean costs of care over 1 year were lower in the training group compared with the usual care group (Stevenson, 2004). In 2006, Toseland and Smith examined whether a health education program for spouse caregivers of frail elderly persons reduced health care costs. They found that total costs for caregivers who received training declined over a 30-month period, and although costs initially increased for care receivers, they also declined over time (Toseland & Smith, 2006). There are 2,681,788 Tennesseans older than 40 years who have low vision—meaning that, even with glasses, they cannot read medication labels, see street signs, or get around safely (Prevent Blindness America, 2008). To serve them are 40 certified vision rehabilitation professionals (Academy for Certification of Vision Rehabilitation and Education Professionals, 2017); of the 53 occupational therapy practitioners nationwide who have specialty certification in low vision from the American Occupational Therapy Association, only 2 practice in the State of Tennessee (American Occupational Therapy Association, 2017a). The Occupational Therapy Practice Framework: Domain and Process, 3rd edition, provides a broad description of clients: “persons, groups, and populations” (American Occupational Therapy Association, 2014, p. S2), which supports interventions aimed at caregivers. Additionally, the American Occupational Therapy Association specialty certification in low vision includes language to reflect this inclusive description of the client with low vision (American Occupational Therapy Association, 2017b). Currently, there are no occupational therapy guidelines for treatment interventions specifically for caregivers of clients with vision loss. In addition to making economic sense, caregiver training can positively influence the well-being of both the caregiver and the care receiver (Chinchai et al., 2010; Huynh-Hohnbaum et al., 2008; Kalra et al., 2004; LaVela et al., 2012; Leutz et al., 2002; Shyu et al., 2008; Sörensen et al., 2002; Stevenson, 2004; Toseland & Smith, 2006). Training that is tailored to the goals of the caregiver and that involves active participation produces the most beneficial outcomes (Elliott et al., 2009; Foster et al., 2009; Smith et al., 2008; Sörensen et al., 2002; Washington et al., 2011). Caregivers are more likely to participate in training in their natural environment and while performing their role, such as at discharge of the care receiver from the hospital or while taking their loved one to a medical appointment (Shyu et al., 2008). Occupational therapy practitioners are ideally suited to the role of providing client-centered, individualized caregiver training. The primary objective of this report is to describe the outcomes of an occupational therapy intervention delivered to informal caregivers of clients with low vision. The Hamilton Eye Institute Low Vision Clinic provides comprehensive services, including occupational therapy, for those within a 200-mile radius covering the states of Tennessee, Mississippi, Arkansas, Kentucky, and Missouri. Of clients attending the clinic, 90% are accompanied by caregivers—spouses, parents or children, relatives, or friends seeking to understand their loved one's condition. A portfolio of critically appraised sources was developed according to established guidelines (Law & MacDermid, 2008) to gain a contemporary understanding of the mutual needs of caregivers and care receivers. The intervention design was based on characteristics of effective caregiver interventions found in the literature. The occupational therapy intervention emphasized active participation through individualized educational experiences (Brereton et al., 2007; Lee et al., 2007; Smith et al., 2008; Sörensen et al., 2002; Visser-Meily et al., 2005). Training lasted three to five visits, each approximately 45 to 60 minutes long (Kalra et al., 2004). Caregivers were seen individually in their preferred setting. The program was tailored to each participant according to the visual impairment of his or her care receiver, but each program contained the following elements: (a) educational materials; (b) an experiential component; and (c) practical tools and tips (Table 1). After institutional review board approval was obtained, interested individuals were purposely recruited through the Hamilton Eye Institute Low Vision Clinic. For inclusion in the study, the caregiver had to be a family member or close friend of the care receiver. Paid caregivers were excluded. Potential participants were identified during occupational therapy sessions with visually impaired clients who attended the low vision service. A total of 52 sessions were conducted over the course of 31 visits. In the absence of a psychometrically validated assessment tool, a survey was designed to determine the effect of the intervention. The survey was developed with input from 13 occupational therapy clinicians, 1 of whom had expertise in the field of low vision and 1 of whom had experience in survey construction. All 13 reviewed the survey instrument for content validity, and their recommendations were incorporated into the final 13-item questionnaire, which was administered on paper. 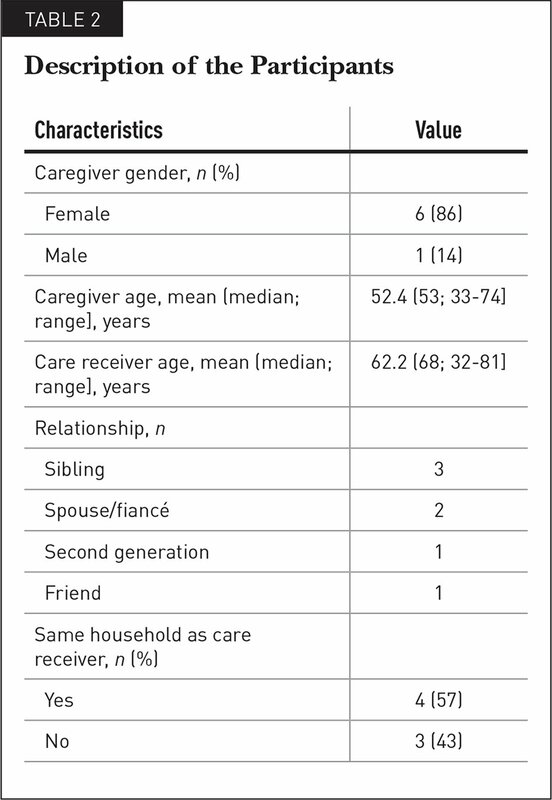 In addition to five demographic items, the survey contained five statements about the caregiver's perceived knowledge or understanding of the care receiver's eye condition, its effect on occupational performance, difficulties in daily activities related to vision loss, and skills required to help the care receiver to be more independent and to get around safely. Participants circled their responses from a rating scale consisting of four levels of agreement (completely agree, mostly agree, mostly disagree, and completely disagree). Three open-ended questions asked about the relationship between the caregiver and the care receiver, challenges associated with caregiving, and benefits of caregiving within the past month. Participants wrote their responses in spaces provided on the questionnaire. The quantitative and qualitative data were collected before the start of the program and after its conclusion. Quantitative data from completed surveys were tallied, and qualitative responses were coded for themes with a generic analysis (Creswell, 2011). Two additional occupational therapists examined the emergent themes so that data were triangulated to maintain credibility. Eight participants were enrolled in the program, which took place during a 9-week period. One participant left the program after the first visit (Table 2). At the start of the intervention, responses were distributed among all response types. At the end of the intervention, all of the responses were clustered around the values indicating agreement with the five statements. Of 35 possible responses to the five statements, 29 were rated as “completely agree” (83%) and the remaining 6 were rated as “mostly agree” (17%). 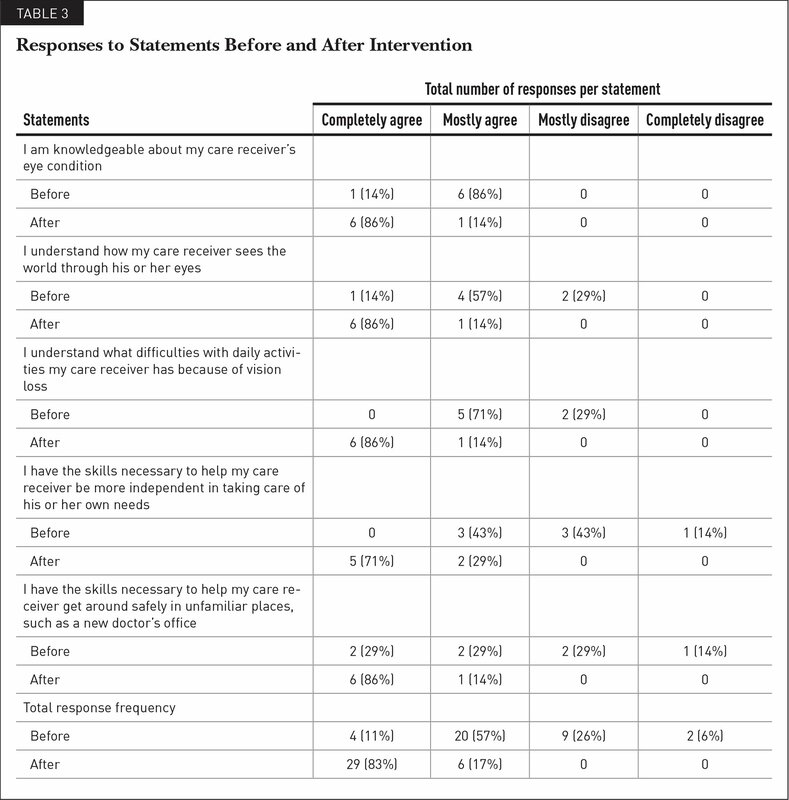 None of the participants reported disagreement with any of the five statements (Table 3). Relationship with the care receiver. Overall, caregivers reported good relationships with their care receivers at the start of the intervention. For example, Participant 2 described his relationship with his care receiver as “very loving, caring, mutually joyful and affectionate,” and Participant 6 stated, “My relationship with R is good. We are very close.” There was also an undercurrent of tension within the dyad, as expressed by Participant 1, who described the relationship as “tentative. She has so many problems going on . . . .” A similar response was provided by Participant 6, who, in addition to the previous statement, continued, “In the past month, though, I've had to fuss, because R wants to be more independent.” Participant 4 stated, “He's communicating with me better, and I'm learning to be more understanding in more situations now that he lets me sit in on his doctor visits.” Overall, the predominant theme was that of underlying frustration within a close relationship. In the final survey, all participants expressed improved relationships with their care receivers. Participant 1 described feeling “a bit more at ease with it all. Having knowledge about her condition has helped her to relax about losing her sight some. By us being aware, she can feel secure about being cared for.” Despite describing the situation as “busy, hectic,” Participant 2 noted that the relationship was “good, close, and caring, for the most part.” Participant 3 reported, “We are like family,” whereas Participant 4 described that her relationship had “very much improved.” Participant 6 stated, “He seems to follow instructions better, so we get along great. I think that it is because he knows or feels that now I am more knowledgeable of his condition.” Participant 7 expressed similar feelings about the effect of the intervention on the care receiver, stating “X is more receptive to our help.” Participant 8 noted improvement in the relationship by stating that it “continues to get better day by day.” Overall, without exception, all participants reported a definite improvement in their relationships with their care receivers at the end of the program, where frustration was replaced with acceptance. On the final survey at the end of the intervention, participants focused less on the challenges of caregiving. Participant 1 noted, “It hasn't been very difficult,” and Participant 3 reported, “There has been no difficulty.” Similarly, Participant 7 elaborated, “It is no longer frustrating because through this program I've learned . . . some of the challenges (faced by) a person with low vision.” Two participants noted continued difficulty being patient with their care receivers. Participant 2 provided a detailed explanation of challenges regarding transportation and getting around unfamiliar environments, and Participant 8 simply stated that one of her challenges was “being patient.” Participant 4 described the difficulty she had grasping just how well her care receiver was doing despite having low vision as “being aware of and understanding of how marvelously he is functioning in all of his activities.” Participant 6 expressed a similar sentiment, saying, “The most challenging part was to try to look at the world and function as he does through the simulator.” In summary, at the end of the program, participants expressed less concern for their care receivers than they did at the start of the program, and concern was replaced by a sense of understanding. Most beneficial part of caregiving. The last question was, “What has been the most beneficial part of caregiving in the past month?” This question was answered in a variety of ways at the beginning of the survey. Participants were rewarded emotionally, as expressed by Participant 1, who stated, “When she is in her good moods, we have fun joking around.” Participant 3 expressed similar sentiments and reported a sense of being rewarded by “helping in emotional needs.” The most prominent theme was that of feeling emotionally rewarded with a sense of closeness by being able to help care receivers and understand their needs. At the end of the program, many participants listed among the benefits of caregiving their new ability to understand the effect of vision loss on their care receivers as well as their new skills in facilitating occupational performance. Participant 1 stated, “The resources provided will be most helpful,” whereas Participant 4 reported the benefits of “having the new skills and knowledge to help him navigate, especially in unfamiliar areas, without acting or seeming to act condescending.” Participant 6 elaborated, “The beneficial part was to better understand his condition, how he sees, what he sees, and why a simple thing like feeding himself is so challenging.” Overall, the responses indicated a deepened sense of empathy with the care receiver. Results showed that this intervention increased understanding of the effect of vision loss on occupational performance in caregivers of clients with low vision. Participants also reported improvements in their relationships, decreased challenges associated with caregiving, and increased rewards of caregiving. The results of the intervention reinforced and reflected themes found in the literature, for example, caregivers' experience of a role that is both burdensome and satisfying (Carbonneau et al., 2010; Moghimi, 2007; National Alliance for Caregiving, 2015; Silva-Smith et al., 2007). Similarly, participants voiced their own challenges and the rewards of caregiving for a person with vision loss; however, at the end of the program, they reported a reduction in challenges and an improvement in satisfaction. The simulation component of the intervention made an enduring impression, and participants made reference to it when they were given practical information (e.g., how to safely guide the care receiver through unfamiliar environments) or when they sought to further their understanding of the cause of the care receiver's visual impairment (e.g., how the care receiver might experience loss of visual acuity as a result of macular degeneration). Although Smith et al. (2008) reported that active information interventions resulted in significantly improved caregiver quality of life compared with a control group, none of the previous studies specifically mentioned a component of simulation in their methods. The simulation is a hands-on experiential component rooted in occupational therapy because it provided participants an opportunity to engage in occupations while experiencing the effects of vision loss, figuratively placing the caregiver in the care receiver's shoes. The simulation component may have profound and lasting effects on the ability of caregivers to perform their roles competently. Clear limitations included the small sample size and the short duration of the project. In addition, although the instrument was tested for content validity, it had not been pilot tested before this project. Surveys were completed in the presence of the clinician, which may have introduced additional biases. The design of the project did not allow for the measurement of long-term benefits to caregivers; benefits to care receivers were not measured or considered. Additionally, not enough time was allocated to determine the cost benefits of the project, particularly because visits were conducted in the homes of care receivers, thereby raising the immediate costs of implementation. All of these factors, though, point to directions for future research. Further research is recommended on the benefits of simulation as an experiential component of an intervention. If simulation of the client's vision loss allows caregivers to understand its effect on occupational performance, they may gain insight into the types of occupations that require more assistance than others, leading to improved prioritization and balance of caregiving tasks and improved adjustment to the caregiving role. Occupational therapy practitioners have a unique contribution to offer caregivers by helping them to comprehend, through real-world simulations, the functional effect of disabling conditions on occupational performance. An expectation of involvement in the process of rehabilitation shared by the practitioner, client, and caregiver. Hands-on simulation experiences of the client's visual impairment for all caregivers. Information about vision, the client's visual condition, the trajectory of the condition, and the use of glasses. Recommendations for appropriate illumination for various environments and tasks. Training in methods to safely guide the client through unfamiliar environments (e.g., use of the sighted guide technique). Provision of information about local, state, and national resources for people with low vision (e.g., Talking Books program). Acknowledgment of caregiver burden and recommendations for support groups or services. Practical strategies for modifying the client's context as requested by the caregiver. Misunderstanding of existing policies in the health care environment may unnecessarily prevent application of these recommendations. The Health Insurance Portability and Accountability Act of 1996 (U.S. Department of Health & Human Services, 2008) may be cited as a reason to withhold information or disallow participation of family and friends in the care of the client undergoing low vision rehabilitation. This misconception may lead caregivers to expect to be left out of the therapeutic process and the clinic while sitting in a waiting room. Another possible barrier to the inclusion of caregivers in the therapy process is potential misunderstanding of the definition of the client by practitioners and those who pay for treatment. Policies related to privacy need to recognize this expanded definition of “client” to include informal caregivers who are not necessarily related to the care receiver. Caregivers should be viewed as clients throughout the process of occupational therapy, not merely included at the end as an afterthought. Caregivers should be expected to participate in the process of occupational therapy from its onset. Inclusion of caregivers at the start of treatment may reduce the number of treatment hours needed and accelerate the attainment of goals. Academic programs should emphasize the need to include informal caregivers in treatment. Continued focus on clients as having problems that require resolution, restoration, adaptation, and modification only perpetuates a positivist, reductionist approach that reduces a problem to a single component. A holistic approach to rehabilitation demands consideration of all factors as barriers or facilitators of healing. This project supported two of the aims of the American Occupational Therapy Association's vision for the coming decade, known as Vision 2025, that occupational therapy “maximizes health, well-being, and quality of life for all people, populations, and communities through effective solutions that facilitate participation in everyday living” (American Occupational Therapy Association, 2017a) by providing evidence for an intervention to increase caregiver knowledge and possibly foster an empathetic response by the caregiver toward the client with low vision. Understanding how clients with low vision perceive the world can help caregivers to make necessary adjustments to living environments to support care receivers' engagement in occupations. Clearly, caregivers of those with uncorrectable vision loss have a critical role that can facilitate or hinder the ability of the person with low vision to engage in daily occupations. Bambara, J. K., Wadley, V., Owsley, C., Martin, R. C., Porter, C. & Dreer, L. E. (2009b). Family functioning and low vision: A systematic review. Journal of Visual Impairment & Blindness, 103(3), 137–149. Creswell, J. W. (2009). Research design: Qualitative, quantitative, and mixed methods approaches (3rd ed.). New Delhi, India: Sage. Law, M. & MacDermid, J (Eds.). (2008). Evidence-based rehabilitation: A guide to practice (2nd ed.). Thorofare, NJ: SLACK Incorporated. Silva-Smith, A. L., Theune, T. W. & Spaid, P. E. (2007). Primary support persons for individuals who are visually impaired: Who are they and the support they provide. Journal of Visual Impairment and Blindness, 101(2), 113–118. Smith, J., Forster, A., House, A., Knapp, P., Wright, J. & Young, J. (2008). Information provision for stroke patients and their caregivers. Cochrane Database of Systematic Reviews, 2, CD001919. doi:10.1002/14651858.CD001919.pub2 [CrossRef]. Sussman-Skalka, C. (2002). Family and friends can make a difference! How to help when someone close to you is visually impaired. New York, NY: Lighthouse International. Ms. Weisser-Pike is Assistant Professor, Department of Occupational Therapy, College of Health Professions, University of Tennessee Health Science Center, Memphis, Tennessee. Address correspondence to Orli Weisser-Pike, OTD, OTR/L, CLVT, SCLV, CAPS, Assistant Professor, Department of Occupational Therapy, College of Health Professions, University of Tennessee Health Science Center, 930 Madison Avenue, Suite 601A, Memphis, TN 38163; e-mail: oweisser@uthsc.edu.